When I think of growth, I think of two ideas that are diametrically opposed to each other: On the one hand, growth is a progressive movement forward towards an expected end. This type of growth is linear and one dimensional. On the other hand, the other type of growth is a topsy-turvy growing edge that ends up not where we thought it would but can feel expansive, refreshing and good at the end of it. It feels unrooted and ungrounded and often, we find it hard to grasp its ultimate destination. This is multidimensional and comprehensive. It usually does not feel good at the moment but at the end, if we look back, it really was to our benefit. Every day, I wake up with the first type of growth in mind as I anticipate the sequential and orderly “must dos” of the day so I can feel accomplished and satisfied at the end of the day. However, those days barely exist. Yet, I want them daily. The second type of day? Every single day! Often, we think of growth in terms of children and how they grow in height and look different over time and magically become adults at age 18. Yet, science tells us that the brain does not mature, or is not fully formed until at least 25 and sometimes even into the 30s. Then they stay static (really?) until midlife when they reverse and start aging. Right? Wrong. Brain plasticity tells us we can grow and change over our entire lifetimes. We can become artists at 80 and learn new languages even into our 90s. I am a serial entrepreneur. I will always work for myself. I love it. I live for it. However, it is the most challenging thing I have ever done in my life. The greatest learning, I have ever experienced, was launching, sustaining and growing a business. It is also a daily opportunity for growth. I encourage my clients to think of growth as expansion. That adds a different spin to it. Somehow, growth takes up a linear trajectory in our language and in our internal ideas around growth. We look at numbers and we make targets based on a time-space continuum. This year, I will make X dollars and next year, I will triple that amount. You see, we can only anticipate growth through the eyes of planning but when that growth, or rather, expansion happens, it requires us to reflectively revisit our anticipated growth and keep in step with the raw data that emerges. Growth is what we plan on. Expansion is what actually happens. Enjoy it. It is natural. Count the gifts within it. Iyabo Onipede is a Leadership Coach based in Atlanta, GA.
Growth is a word many of us deeply understand and value highly. We want our companies to grow. We want our innovation to grow. 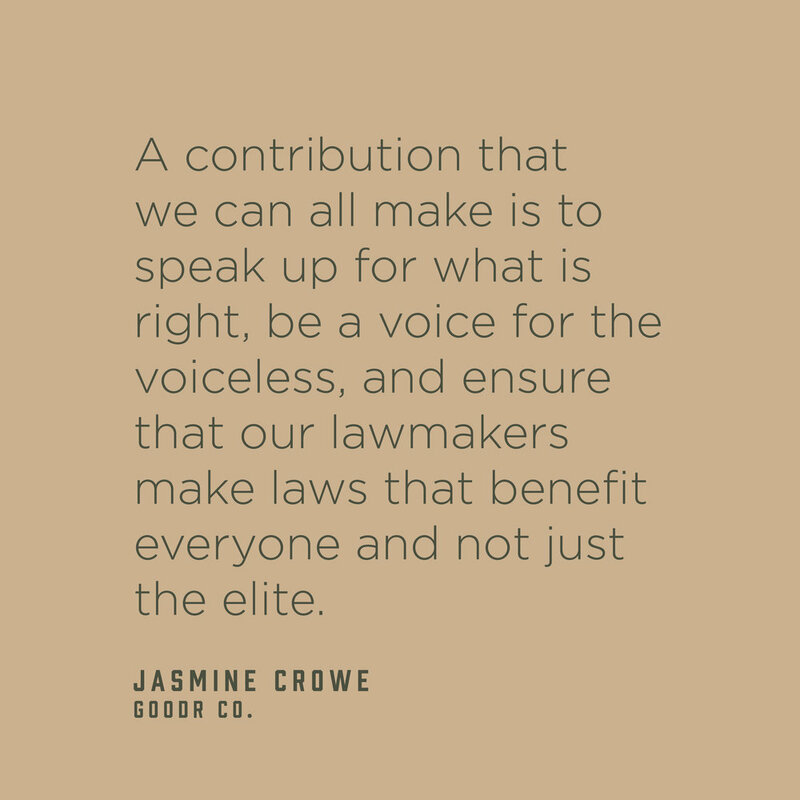 We want to grow as individual people. But, maybe growth as a team in our work for social good needs a fresh perspective. At times, the pace of growth is happening at a rate that is hard to maintain, hard to keep up relationally, and hard to sustain on personal levels when balancing work and life. The problem we are trying to solve at this moment is not if we will grow, it is how we will grow together in sustainable ways. As a leader of a community of start-ups doing good, I constantly need to be growing. I have experienced first hand how the pace of my growth has a direct impact on the growth of the community as a whole. I have found five unique directions that have guided my growth in my work, life, faith, and relationships. I am just like you; I want to grow in new and different ways. I see broken things in the world and I want them to get better. This is not unique to my journey; this is the story we are all continuously living. We want the world to get better, and we know the best place to start is with ourselves. In each of our journeys, there are moments we can point to that have led us toward at least one of five growth directions: expectation, contemplation, preparation, application, and destination. Take a moment to consider how these directional arrows of growth have impacted who you are and who you are becoming. The expectation of growth in most western environments is up and to the right. This is often quantifiable growth through financial dashboards and numbers of followers. As influencers, we want to show progress numerically and to prove that growth is happening. This form of growth gives confidence to ourselves and our teams and helps us measure progress in our purpose. This is what we expect and what we desire to see. Contemplation seasons of growth happen when data does not match expectation and when we can numerically show that progress has been replaced by digression. This is our time for concern. A lack of numerical growth creates a sense of urgency, causing us to pause and reflect on what is not working. Down and to the left generates many questions, from purpose to programs to models to marketing, all pointing toward a negative trend and giving us desire to turn the ship. Sometimes our greatest growth happens in these moments when we want things to get better. This is when we wonder why, when we slow down, and when we try to solve problems. The preparation area of growth requires learning from people who are different than you in order to expand your perspective. This is often experienced when you travel to a different culture or country. On a personality level, this can happen through matching introverted and extroverted people in deep friendship. When problems in the world have names and faces, it causes us to think differently and to act differently. Sometimes we experience new things not knowing how it will help us in the future, but with time, hindsight offers an understanding perspective. This is the pursuit of seeing the world in a way you don’t currently see it. New perspectives shape how you operate moving forward. The application moments in our lives are trying to make sense internally of what has happened to us externally. Situations or unexpected changes in our family, health, community, or occupation can change the trajectory of our lives. Some growth moments in life create feelings at such deep levels that transformational growth occurs. These moments of deep thought are some of the most meaningful and hardest seasons to understand. This is when we realize we are not in control, and we seek to find reason in the midst of confusion. The destination growth leads us in a long view perspective of purpose or mastery. There is never a direct or straight path from where you are today to where you dream of tomorrow. In this mindset of growth, we constantly circle problems, inching closer and closer with every turn. On this journey, we gain wisdom, clarity, and understanding. Sometimes it circles us closer toward becoming an expert on a topic or issue. This is the journey of finding our calling through a series of life turning moments with the hope of a resolution in the end. As we grow, we are always moving in a direction. This movement is called progress. I believe that progress is simply the daily decision to make things better in a broken world. May the growth direction you are moving lead all of us to positive progress, not only in our personal lives but for the betterment of our communities. A new breed of organizationhas burst onto the scene to act as the counterbalance. The new kid on the block is waving the “social good” flag and finding ways to leverage everything from supply chain to earnings to create all types of positive impact in the world. And some of these businesses are earnestly doing a good job at striking the balance of profit and purpose. 10 years ago my friends and I set out to provide meaningful work to war-affected mothers in Northern Uganda. We taught a small group of women how to make headwear, we started a brand, and we worked to educate customers about the positive impact their purchases had. Our unique take on our product and how we proved the “social good” of our work was to have the makers sign each completed piece, so our customer could come to learn about the specific person who made their product. Fast forward a few years and our brand had some great success, we expanded our product offering and started a second location in Peru, but the concept for a consumer to know WHO made their product was still very isolated. We were one small brand trying to shift an industry on our own. It became clear that we were limiting the impact of our work, by holding onto it too tightly. Truly, if we are honest with ourselves, isn’t the point of leveraging business principles to generate goodwill for people and the planet something we all should be doing? Don’t we all win if more businesses are weaving positive values into their business operations? Then why do we insist on setting ourselves apart to tout our brand as THE social good solution? That’s why we started KNOWN SUPPLY. To take this concept — this alternative way of viewing your clothing by having a human story attached to it — and give it away to all those who share our value system. Then, as more of us choose to put people first through our clothing purchases, more people will be exposed to this fresh alternative. And our mission will be accomplished at significantly greater scale. Social good in business is an incredible movement that is taking place in our present age. My encouragement is to not squelch it by holding on too tightly to the thing that you feel differentiates your brand, because in doing so you may be in contradiction to the cause you set out to accomplish: to help the most people possible. While we’re extremely proud of our social impact, we (collectively) need to be looking for ways to build bridges and engage the rest of the business community in that very work. Let’s get real. Every week we open up our social apps and take a quick look at how many people are following us. We check the project account, personal account and business account. When we meet a new person, we check out their profile and quickly determine their level of influence based on the number that it says. Influence has become a number and we instinctively quantify our own and others with just a few clicks and searches. These little numbers are impacting who we think is important (including ourselves). This is the new precedence that permeates our culture. Rising and falling. Up and Down. Known or unknown. Influence has become defined by the platform we control. Platforms are usually defined by quantity. There is always someone with a platform with more people than me or you. Which leads to this question: Is our value truly determined by the quantity of our followers? This is the first time in history that every person could quantify their following and if you are like me, sometimes you wonder if this is good progress. These so called ‘levels’ of influence are driving much of our behavior. You are either at the top or you are looking up trying to get ‘there.’ We instinctively know more followers results in more attention. We make choices based on the quantity of reviews and the collective agreement of ratings. We pay money to boost exposure, followers, and reviews with the hope of a larger platform. And on a daily basis, we fuel the hype through our behavioral decisions. So, on a personal level, why do we do this and why do we care? The problem is personal. We want to be seen and to be known. We want to be seen with people that are known. What if we changed our view of the platform. What if a platform is only as important as how we use it. What if we valued a platform not by how many are watching, but by our intentionality and purpose? I was crafting the message, stage, experience and content for a massive event, literally 14,000 people were listening. I chose to leave it all. It was an influential platform and shaping many thinkers in a specific audience. But I chose to leave. I remember getting messages from people trying to understand why? What I have found is that if I can help one person find why they exist, the exponential return is much greater than the platform I once influenced. When I give intention to the life of one person, it will always have a greater return than the appearance of a thousand. We all have the ability to shape small circles that are around us everyday, this is what changes the world. The table where you are eating dinner. The family you are parenting. The marriage to your best friend. The team that you lead. The class that you teach. The program you run. The person you know through carpool. If those closest to you don’t feel your intentional love, encouragement and pursuit of their purpose - then your focus is probably only based on appearance. Appearance is no platform at all. Now, what if you are leading an organization, one where you need more people to know the problem you are solving? This is the strategy that I have found for increasing your platform for your problem: make progress on the problem. Tell stories of people impacted by the progress. Solve the problem. Whenever you are making a true difference, your name will become known and it will be much more intentional. Platforms are not bad if used with intention and not for attention. I recently learned a great lesson in conversation with Lecrae, a pioneer in much of his music career with a quantitatively large platform. He mentioned something I will never forget. “I want my ceiling to be the floor for others.” This simple thought is one of the greatest I have heard about platforms. When we build a platform for ourselves, its all about appearance. 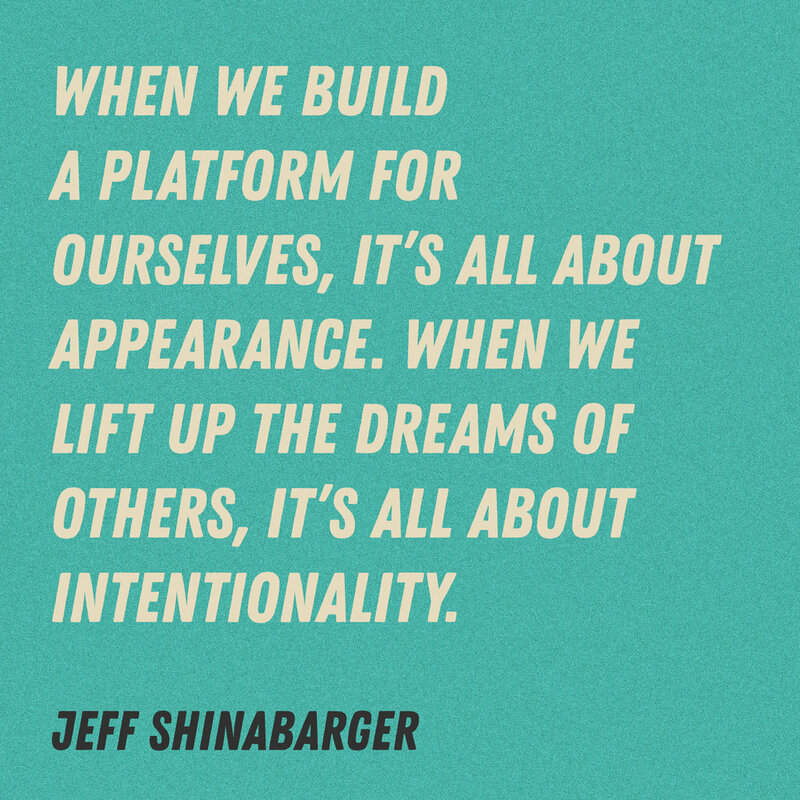 When we lift up the dreams of others, it’s all about intentionality. When we build a platform for the sake of others, it gives reason to quantity. A platform is only as good as how you use it. Whether your platform is five or five thousand, you have the ability to help shape the purpose of others through it. The formation of thoughts and ideas can come easy to marginalized groups, because when boxed into corners, and, or forced into spaces of discomfort, the choice to create, and innovate is indecision; somewhat of an unspoken organic nature that is sustained by the desire to survive — to live a better life — to beat opposition — to overcome “the struggle”. Therefore, innovation and idea generation have always been (and still are) mandatory for many of us. And arguably, when the two concepts merge, they tend to feel more biological than “social reaction”. Amongst the many things that inspire and motivate me to do, there are equally just as many barricades to duck under, glass ceiling to shatter, and red tape to dismantle. Long before I had the language: “racial economic disparity”, “gender oppression”, “white supremacy” and “institutionalized racism”, I felt the definitions living and breathing inside of my community, throughout my schools, and within my world… every play in my book had to be about (not just) creating alternatives and solutions for some of the world’s most pressing issues, but intentionally fighting through systems of bias. My ideas have never had the privilege of just being ideas, alone. There has always been a consideration for someone, something, and somewhere outside of, and aside from, myself. So, cheers to the abundant amount of discomfort that once stood as distraction, that thankfully and currently, are deemed as drivers for the Doer. I’ve heard this statement for years now. It’s been used as both a sincere and backhanded compliment. As a result, I ran from the title ‘dreamer,’ but the truth is, I am one. In fact, when I was in college, one of my favorite social activities was to brainstorm ideas of potential businesses and nonprofits with friends. Then, we’d write each idea in notebooks I still have today. 1. Ideation is an act, not a skill. It’s the sum of multiple skills. Make ideation a muscle that operates from memory. 2. Ideation reveals the heart of the ideator. Creativity was missing from the list. Why? By definition, creativity is the ability to create, which we all possess. Therefore, 1) we’re all creative and 2) creativity isn’t a roadblock to ideation. However, our belief in our creativity is. It’s difficult for the mind to explore what the heart sees as impossibilities. Consequently, our limiting beliefs — insecurities, fears, lack of self-esteem — are the true roadblocks. I imagine a significant portion of us ideate in group settings, which typically further exposes and/or amplifies those same roadblocks. What are we to make of this? Ideation is deeply personal. Our commitment to overcome ourselves and provide grace to others (when their issues surface) is a key to ideation. 3. Ideation is not innovation. Novelty characterizes innovation. As Jason Dyba, the creative project manager for Passion Conferences, recently told me, “Ideation under the pressure of innovation is unnecessary.” It’s true. We often hunt for the new when better will do. Better matters because life matters. Life is measured by the quality of our experiences, relationships, and contributions. Let’s create better quality experiences, relationships, and contributions for ourselves and others. Ideation is a gateway to better. As someone invested in my community, I would add that idea makers don’t execute their ideas for their idea sake. Instead, idea makers move their ideas from their imaginations into reality to create a solution for the greater good. As a team member of DO GOOD X, I’ve journeyed alongside faith-rooted entrepreneurs who want to do good in the world. These entrepreneurs—idea lovers and makers—birth many ideas. But what is needed to help idea lovers turn an idea into a good idea? (We all know that all ideas aren’t necessarily good ideas.) And, how do we create a space that empowers and prepares these idea lovers to be idea makers for social good? Here are three playful actions I’ve noticed that support these entrepreneurs in becoming idea makers for good. TOGETHER, idea makers dance, experiment and challenge. Remember grade school dances? Peers stood against the wall waiting for the perfect opportunity to share their moves. Or they were scared out of their minds to move. The fun always began when a courageous person decided to get on the dance floor. And it became a party when others joined. Idea makers thrive when they have a space to DANCE with other idea people. Last year, I experienced a group of 10 social entrepreneurs sourcing financial support, partnerships, product development, potential mentors and prospective investors just among themselves. This is the power of what can happen when you don’t hold the wall and you’re courageous enough to dance with others. I’ve seen committed people test out their idea of a dance routine, wait for the crowd to respond and refine their moves based on reactions. Because the only way to be confident that an idea is a viable solution is to EXPERIMENT and prove it is a possible solution. Prototype, experiment and refine. Having the ability to experiment and fail soft in the midst of supportive, but honest peers is invaluable. Remember, most entrepreneurs succeed because of wisdom that surfaces through failure. Varying levels of experienced dancers challenge themselves and others to do better. Idea makers need spaces to be challenged and to CHALLENGE one another. Is your idea ethical? Does your idea actually solve a problem? Are you “the one” to actually bring a particular idea to life? It’s through these types of questions from others that idea makers learn from alternative perspectives, innovation occurs and they think deeply about their commitment to their idea. So, dance and play with your ideas in community. Challenge yourself and other idea makers. It’s within conversation, collaboration and community with others that you and your idea will thrive…for the long run. Ideation isn’t satisfied with ideas alone. It seeks to create clarity and a pathway for actualization. It also cares enough to invest time and resources necessary to implement well. Ideation may embrace lean, but it doesn’t compromise mission. Are you ready for this? I want to believe you are since you’re still reading this! Iterate Forward – Creating a culture committed to experimentation and iteration will continue to foster and accelerate innovation. It will take a few cycles to get a process going so stay patient and keep iterating forward. Charles is the Founder & CEO at Ideation, an idea-making company that specializes in helping brands scale their business by effectively integrating their strategic plans into day-to-day implementation. He is also the author of Good Idea. Now What? : How to Move Ideas to Execution, a practical book designed to help people move ideas to implementation. Ideation is the act of forming ideas. Its main purpose is to move ideas from conception to implementation.